dogs | Me going green ... and dragging my family with me, kicking and screaming! It was exactly where I figured it would be … under the side table by the couch. I just didn’t want to actually stick my hand under there. Has a tendency to collect spider webs down there … Ick. Anywho. 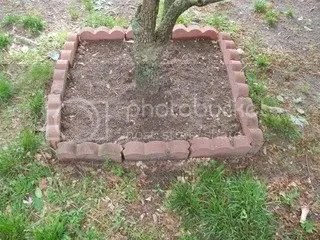 I took pics of my “gardening!” I hope you like to look at pictures of dirt!! It was real nice out on either Tuesday or Thursday night of this last week, so I raked the weeds and crap out of the flower bed out front and planted a bunch of seeds. Hopefully, in a couple of weeks time, I’ll see some cosmos, zinnias, canterbury bells, and something else that started with a C. I don’t remember. Oh! I just remembered that I have a packet of holly hock and columbine seeds. I should do something with them too. They are a couple of my favs! 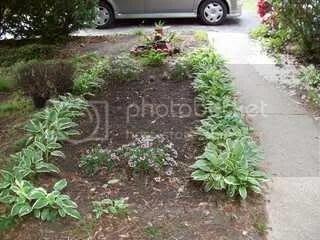 I need to break up the hostas on the sidewalk side again, and fill in the short sides. I just thinned them LAST year, that’s where the ones on the other side came from. Sheesh, they are about the only things that grow well around here … and my guilty truth is that I don’t particularly care for them. They (as well as the house) still belong to my beloved mother-in-law, so, for now … they stay, but I want monkey grass. Last Saturday, M and I planted our nasturtiums under the dogwood. So far, only 1 tiny plant has made it through the soil, and you can’t even see it in the pic, LOL! 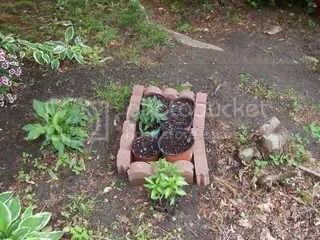 The bricks are to keep the dog from stomping all over the pots and knocking them over.